If you see Stacey Shames and Tim Ries pushing a cart in a Costco in New Jersey, the couple would seem to be like any other suburban parents. But their nights are spent on their passion: music. A Juilliard-trained harpist, Shames performs as a soloist with several orchestras, such as the Chamber Orchestra of Europe, and she also plays with her own group, the Aureole Trio. Her husband, Tim Ries, is a jazz saxophonist who tours with the Rolling Stones, among other bands, sometimes away for months at a time. 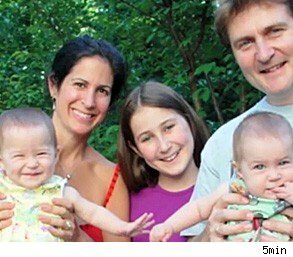 Married for 22 years, the couple have three daughters -- one who is 18 and twins, aged 9. "It's definitely a challenge, managing the lives of two freelance musicians as well as a more traditional life at home," says Shames, noting that when her husband returns from his "sometimes glamorous" life on tour to suburbia, the couple call it "re-entry." Shames, for her part, sometimes feels as though she has a "double life," but she says that she wouldn't have it any other way. Neither she nor her husband were "cut out for a normal 9 to 5 job."